Nine people were taken to hospital after a bus was driven into a bridge and its roof ripped off. The Travel West Midlands double-decker bus hit the bridge in Corngreaves Road in Cradley Heath, West Midlands, just before noon on Saturday. One teenage girl suffered a broken nose while another girl complained of head, neck and back pains. They were taken to Russells Hall Hospital in Dudley along with seven others aged between five and 20. A WMAS spokeswoman said: "Given that there were a number of passengers on the upper deck at the time of the crash, it is astonishing that patients were not more seriously injured as this clearly had the potential to cause more harm." 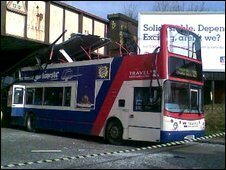 The 139 bus was en route from Halesowen bus station to the Merry Hill Centre when the crash happened. People in the area said it was not on its correct route. Steven Lowe, whose house is next to the bridge, said he was in his home when the crash happened. He said: "I was sat in the armchair and all of a sudden I saw a double-decker bus come through. "I said to my missus, it isn't going to get under that bridge. Five minutes later we heard a big bang." He added: "We ran out and there's little girls coming off the bus screaming 'phone the police'. National Express said in a statement: "Our staff worked closely with the police at the scene of yesterday's accident in Cradley Heath. "A full investigation into the cause of the accident will take place as soon as possible."